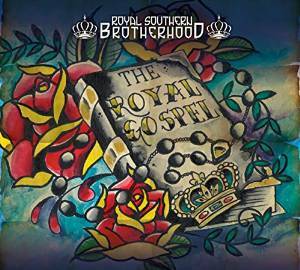 I just received the newest release, The Royal Gospel, from Royal Southern Brotherhood, and it's their best yet! Opening with Where's There's Smoke There's Fire, this band is hot. Tyrone Vaughan "smokes" the guitar strings with a vicious guitar solo and Norman Caesar's B3 ride is very effective. Darrell Phillips bass work, Bart Walker on guitar and Cyril Neville on percussion with Yonrico Scott on drums makes this a spectacular opener. I've Seen Enough To Know is a cool R&B style track with light funky guitar work and a great bass line. Blood Is Thicker Than Water has a super slinky, funky groove with reggae like vocals. An infectious percussion groove and slick guitar tips this one. A really cool track and one of my favorites on the release. R&B/gospel style, I Wonder Why really has a solid bass groove with nicely woven fabric of guitar , percussion, organ and vocals. Excellent! Cyril's fingerprints are on the writing of I'm Comin' Home, a really groove heavy track. The bass line is terrific and the slide work hair raising! Very nice! Everybody Pays Some Dues has a cool James Brown strut courtesy Walker and Vaughn. Vocals are strong and a cleanly executed guitar solo dresses the track. A soft bed of acoustic guitar by Walker and really lush vocals gives Face Of Love a strong face for radio play. Very nicely done. Spirit Man has soulful lead vocals and cool B3 work over a great percussion section. This track shows a modern interpretation of the stumble drum effect that I love so much about New Orleans jazz and an excellent slide guitar solo is scorching. Nice! Hooked On Plastic is funky to the max. A great bass line and well blended vocals over a hot rhythm line and clever guitar riffs makes this a particularly memorable track. Can't Waste Time has a great funky groove and super backing vocals giving it just the right feel. If this track doesn't get you moving, the San Andreas likely won't. Wrapping the release is Stand Up, a R&B style fast paced track that is just waiting to bust loose. Walker and Vaughan trading riffs on this track creates hot dynamics and with a cushion of B3 and hand claps the track had an old style revival conclusion, driven by a driving bass line of Phillips. Steamy ending to a hot release!